How quick has this year gone by!? Christmas is now just around the corner. The children are nearly a week into their Advent Calendars and the countdown is on for the big day. As usual we are thinking of last minute gifts. Me and Hubby have also started reminiscing about Christmas presents that we did or didn’t receive. We both agree that one of the all time classic presents is a child’s first bike. Can you remember your first bike? My first one was a beautiful shiny blue bike with a bright pink elephant on the seat, a 3 wheeled trike!! In fact my Mum and Dad still have it in their shed after all these years!! How cool. 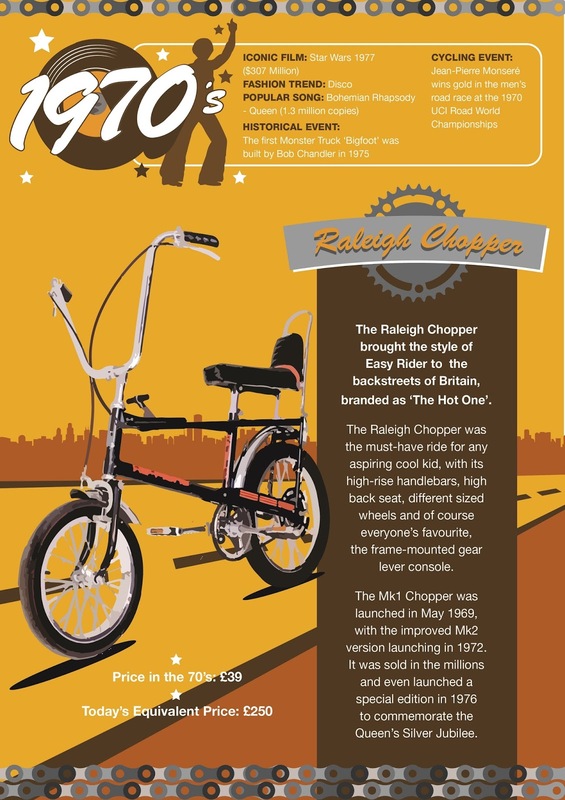 My all time favourite bike as a child though, was the ultimate style classic from the 70s; The Chopper. Being a 70’s child everyone used to have Choppers, Grifters or the Strika all made in Nottingham I believe. and I was so envious of them. One of my babysitters at the time, always used to have her Grandson popping by on his Chopper. I remember having a “backie” on it, and being very worried I would get told off because it said no passengers. He must have known I loved the bike because as he got that bit older and got the Raleigh Burner he gave me not one but two choppers. An orange one and a red one. I did feel proper grown up on them. Like a miniature Hells Angel!! I really wish I knew what happened to those bikes now!! They certainly aren’t in Mum and Dads shed. I checked.!! Take a trip down memory lane with iconic bikes through the decades and relive the memory of your first bike with Halfords. Were you a 50’s child? Did you own a cruiser? The classic paper boy bike. A 60’s child? Did you get chance to get your hands on a limited edition Bowden Spacelander? With only 544 shipped worldwide before production was halted, it made them the most sought after bicycles of this decade. Were you like me; a 70’s child who owned the classic Chopper. A 80’s child and own one of the cool Raleigh Vektar’s or Burner’s. The 90’s child who owned a BMX? My oldest son still has his!! 2000’s and owned a Fixie bike? "Wordless Or Not So Wordless Wednesday Blog Hop.."
How cool! I always had a mountain bike as a kid. Thanks Tamar, I remember when the mountain bike came out, so cool!!! Wow The chopper! That brings back some memories! I've got loads of pictures of me on one as a kid! I never had a chopper although it was my absolute dream to have one…! I had a Raleigh bike and then a brilliant mountain bike which lasted forever. The Rayleigh's bike looks like so much fun got to love the 70's. What a great look at bikes through the ages. Hehe, I remember the mountain bike coming out and think how cool I want one of those. I was born in the late 1960s so it was a chopper for me! The seat was a lot more comfortable than the one I have on my current bike too! I was an 80's child. I always wanted the streamers off the handle bars and those little coloured beads that went on the wheel spokes. Super cool! I was an 80s child and I had those coloured beads on my wheels too! I remember you could get them free with Monster Munch if you saved up enough packets! I remember those bikes, they were so cool!! This is really interesting. I remember my uncles bikes in the 80's . They were so strange looking! Fab post. Never had a proper bike but my kids are in love with theirs already. Is it too bad that I'm literally the only one that never learned how to ride a bike?? Hehe, fun times 🙂 Thanks for stopping by. This is so cool! My dad was born in the 40s, I must ask him what he sort of bike he had when he was younger! Ha! Can remember the chopper. Never has one though.